I first came across Chris DeWildt right here in the gutter, with his excellent and unsettling story McRib Therapy Alleviates Seasonal Depression. That twisted gem left me craving another hit and his novella, Candy & Cigarettes proved to be exactly the kind of high I was chasing. ‘And I looked, and behold a pale horse: and his name that sat on him was Death.’ – Book of Revelation. Okay so Lloyd Bizbang may not be your stereotypical apocalyptic horseman; in fact he is more a victim of circumstance. But just like those equestrian harbingers of doom, death follows Lloyd like a lost dog. It has been snapping at his heels ever since his baby sister drowned in the bathtub when he was just a kid. Today Lloyd is a man in his twenties, but today isn’t much different to all the previous days of his miserable existence. The Cutter brothers have had it in for him since childhood, and it's while Lloyd is on his way home after another of their beatings that he discovers something disturbing in the town junkyard. The town of Horton is an unforgiving place, even if there is nothing much to forgive. Sympathy is thin on the ground and if small town rumors are repeated often enough they have an uncanny way of becoming facts. Lloyd has endured a life of bullying and torment, living in the perpetual shadow of tragedies not entirely of his making. Now the bodies are piling up in Horton like chopped cord, laid in for winter and it all seems to point towards Lloyd, at least in the mind of the local police chief. Only the chief has his own agenda. It is hard not to admire the hapless Lloyd Bizbang and his stoic acceptance of a hand dealt firmly from the bottom of the deck; for him survival is the only aim. To wake up to another day that promises nothing better than the one before is chalked up as a win for the home team. 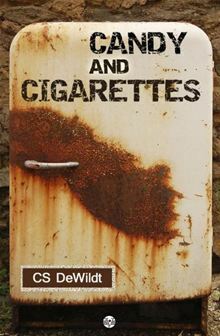 In reading Candy & Cigarettes I came to realize that C S DeWildt is an exceptional writer; he infuses the stark reality of his gritty narrative with a mesmerizing, almost lyrical style. While his characters plumb the unrecorded depths of the human condition his prose just soars and embalms the corrupt flesh of a harsh story with visceral and vivid emotion. Candy & Cigarettes is noir of the very highest order, a dark and moody cocktail of the bleak and the beautifully damaged. It can be yours for around the price of a skinny latte and that my friend is a bargain not to be missed.